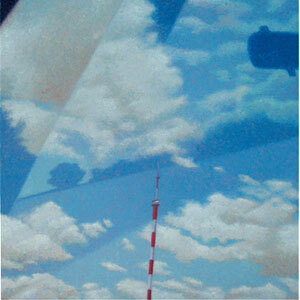 ‘Eskaders’, a solo exhibition of oil paintings by Jacobus Kloppers was hosted from 13 to 29 September 2007. In this series of paintings, Kloppers employs the cloud drifting over the landscape as metaphor for the wondering spirit as it travels through the psychological spaces above past and future experiences. The whimsical characteristic of the cloud is also explored by Kloppers – its ability to appear and disappear, to move without boundaries, to inspire and to evoke emotion – ultimately escaping the hold of place and experience. Wolke dryf vry in ons boonste sig. en sak neer in rou. Wolke skryf verhale en versamel legends. kinders lees hulle soos n boek.